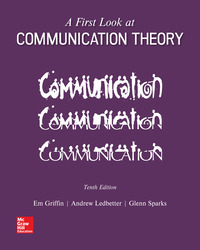 ●	Offers students with no background in communication theory a broad introduction to theories. ●	Discusses a single theory in each chapter, with concentrated coverage giving students a chance to focus their thoughts and engage with each theory, and making it easy for instructors to teach theories in any order. ●	Explores ethical principles throughout the book, emphasizing that communication is a field heavily influenced by concerns about what's right or wrong.